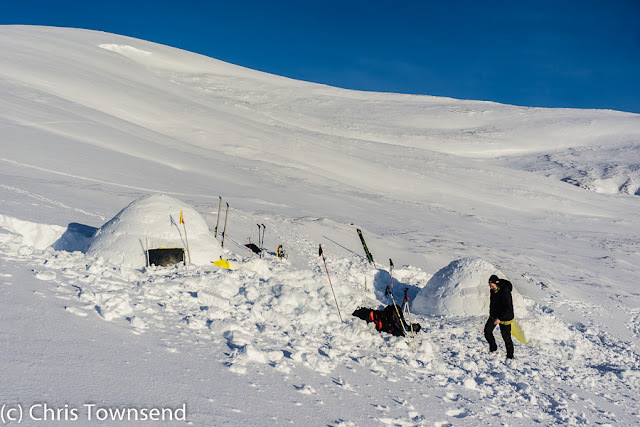 For several years the Inverness Backcountry Snowsports Club has held an igloo building weekend early in the year. 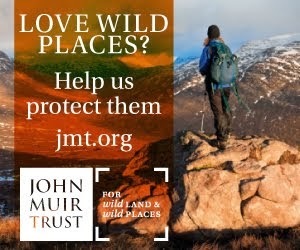 This year the meet was held in Glen Affric. 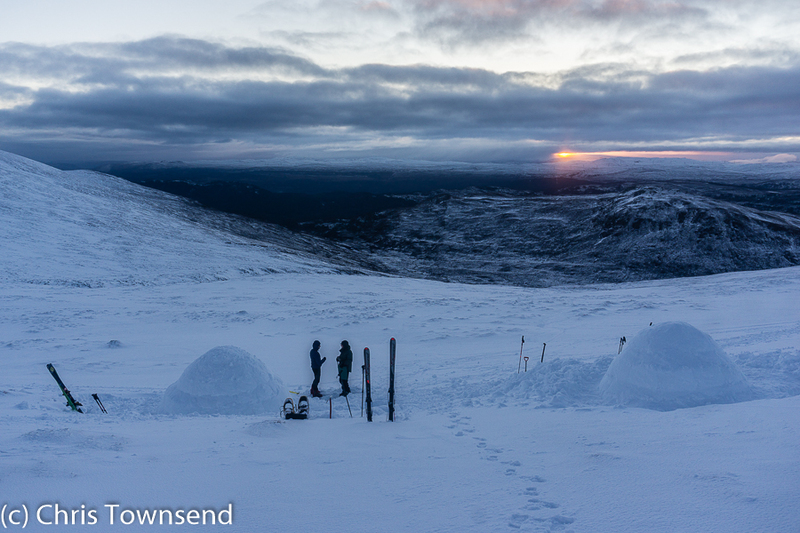 Due to a good forecast I decided to go a day early, hoping to have a fine winter camp under starry skies. It was not to be. I drove to Glen Affric under leaden skies, walked in on a slushy, muddy track and camped amongst young pines on wet snow. During the night it rained, heavily. Walking back down the track to meet the others early the next morning under a dark sky I was contemplating going home. I was to be very glad I didn’t. The eagerness of the rest of the party to get up into the hills and build igloos shook me out of my rather gloomy mood – a mood made worse by the appalling state of the bulldozed hydro works track up Gleann nam Fiadh. 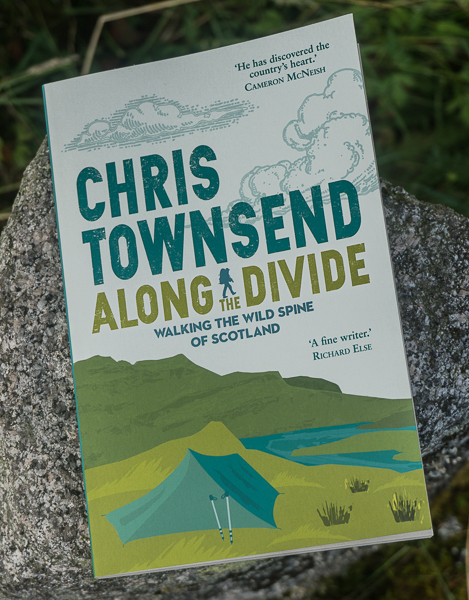 Once we were climbing into appropriately named Coire an t-Sneachda – the corrie of the snows – I was looking forward to the day despite the still overcast sky and an increasingly cold wind. On the side of the corrie at around 730 metres we found a good site for the igloos. The snow here was at least two metres deep. As there were seven of us we decided to build two igloos and out came two of Grand Shelters wonderful IceBox igloo building tools, one of my favourite pieces of gear and one that really is unique. 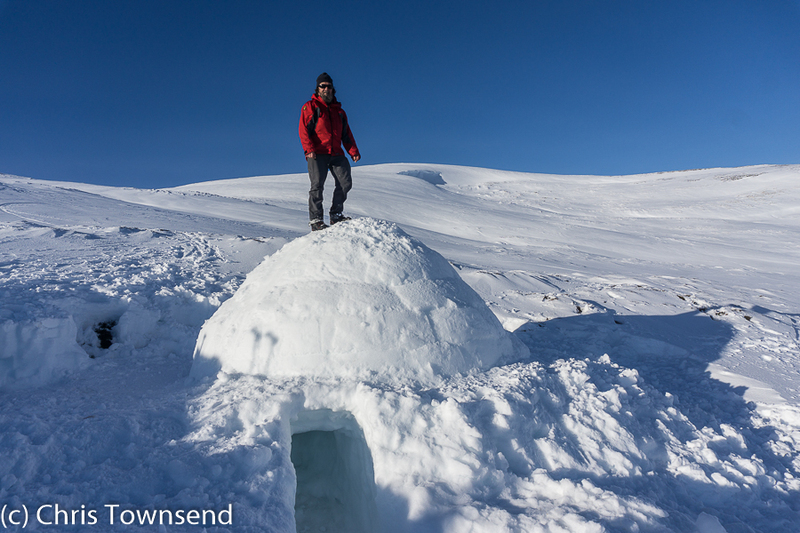 The cold wind and frequent blasts of spindrift kept us going and the igloos were complete in around four hours, quite a good time, especially when some people had never built one before. Inside we were soon warm and comfortable and cooking our meals. Dawn came with a hint of red in the sky though still much cloud. This quickly cleared and the sky turned blue. 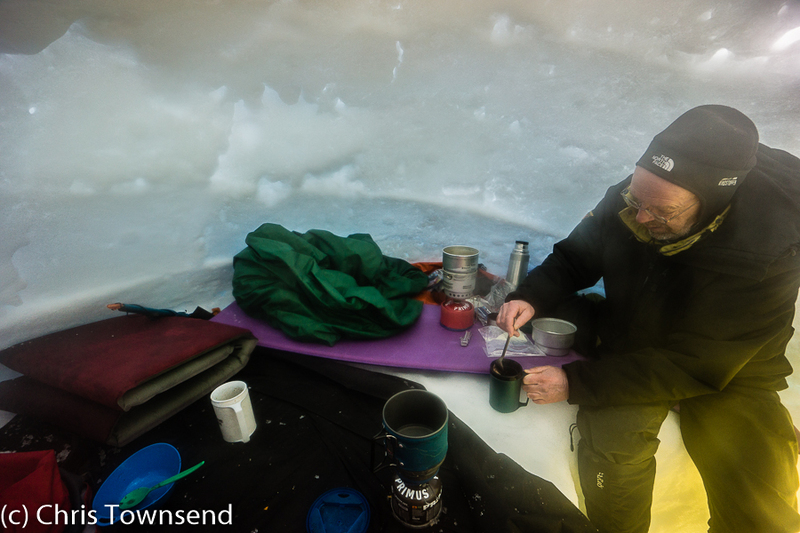 The wind dropped and stoves and breakfast were taken outside, a rare occurrence in the Highlands in winter. 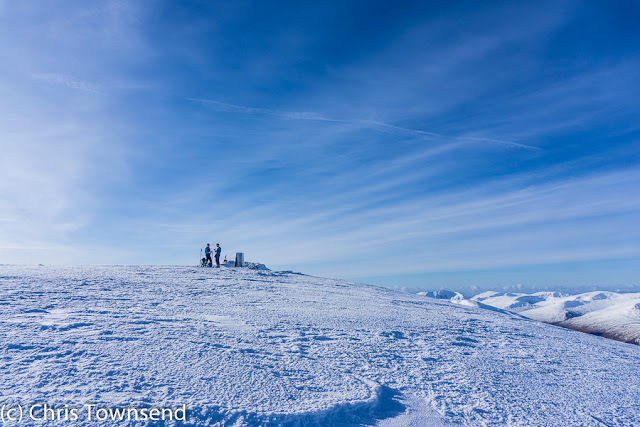 Three of us decided to head up Toll Creagach, some 320 metres above the igloos. 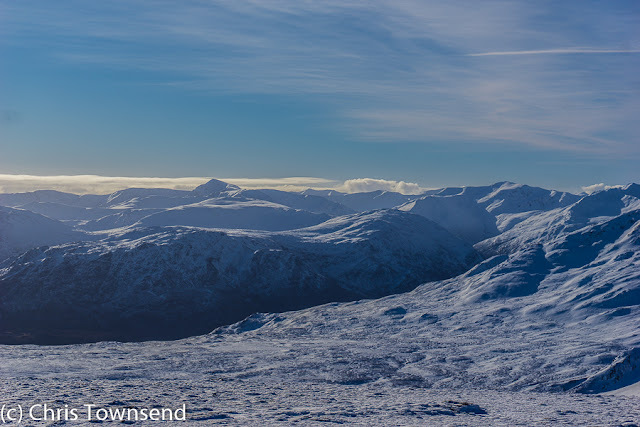 This Munro isn’t particularly distinctive but it is a grand viewpoint and at its best when under snow. On this day the vista was superb with snowy hills rising sharp and clear above brown glens. Under the deep blue sky the feeling was alpine. The sun was warm too and there was no need for hats, gloves or jackets on the summit. I wandered the extensive summit area revelling in the mountains, the colours, the brightness. For once the winter hills felt friendly and welcoming. 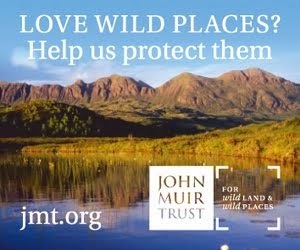 There was a peaceful air and a sense of wild beauty. Eventually we had to depart and return to the igloos. I was on snowshoes and simply walked straight back down. The others had skis and swept back and forth across the slopes, reaching the igloos a fair while before me – they had the stove on for a brew by the time I arrived. 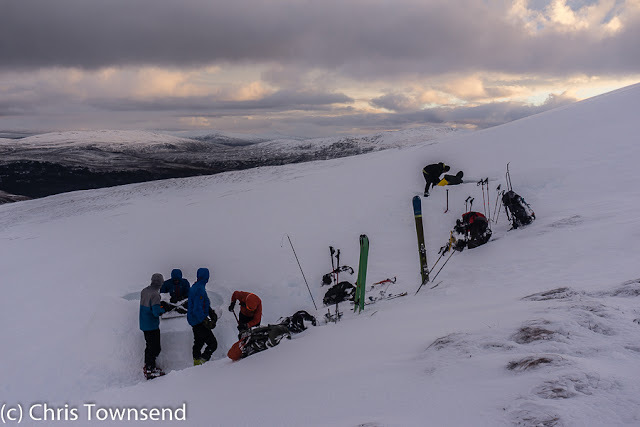 Before departing we climbed onto one of the igloos using an ice axe as a foothold, the only time one was used. Then we packed our gear, said farewell to the igloos, and headed down in the sunshine, arriving back in Glen Affric at dusk. 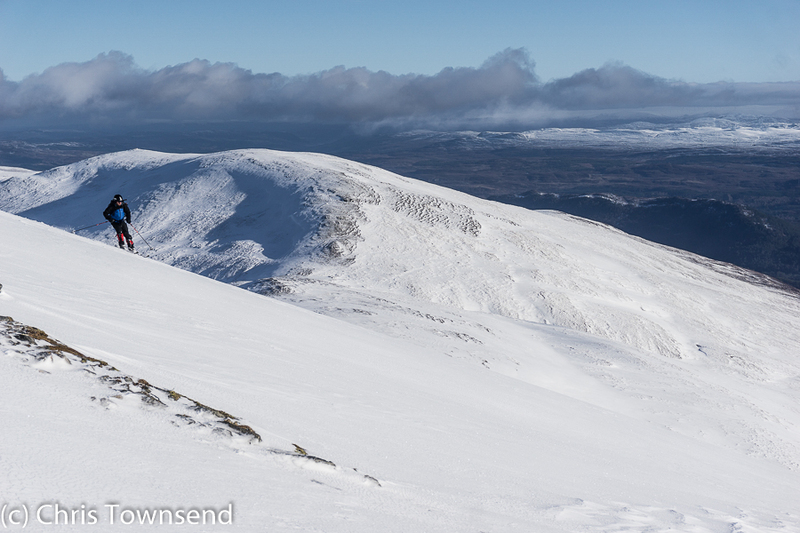 It had been a magical day, a glorious day of mountain perfection. What a privilege to have been there. Thanks to Andy Ince of IBSC for organising the meet and to Andy and the other igloo builders for making it a great trip. I was wondering what you'd been up to Chris. Looks like a great trip after a rather depressing start. You just never know what the Scottish weather will bring but you got yourselves in the right place at the right time. Well done!